Product prices and availability are accurate as of 2019-04-23 22:30:20 UTC and are subject to change. Any price and availability information displayed on http://www.amazon.com/ at the time of purchase will apply to the purchase of this product. 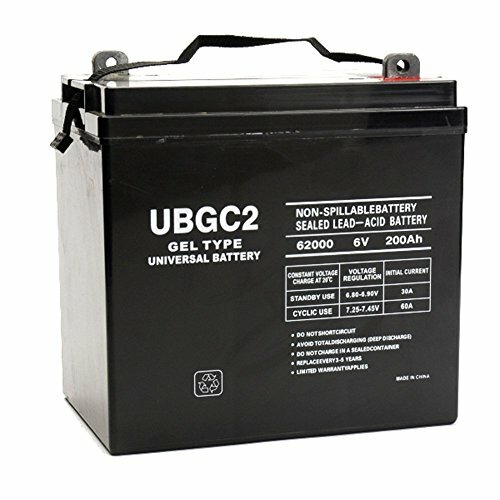 This UB-GC2 is a sealed lead-acid (SLA) absorbed glass mat (AGM) rechargeable battery. AGM and GEL batteries are lead-acid and of the same battery chemistry (lead-oxide, lead sponge, and sulfuric acid electrolyte), but the electrolyte is stabilized differently. In AGM batteries, the electrolyte is suspended in fiberglass mat separators which act as absorbent sponges. This battery comes already charged, sealed, maintenance free, and ready to install. Premium quality absorbed glass mat technology (AGM) is ideal for ATVs, motorcycles, personal watercraft, snowmobiles, UPS systems, alarm systems, exit lighting systems, wheelchairs and more.